There a couple that have hit the table lately that I have really enjoyed, and that I haven't really talked about much here, so I'm going to start to remedy that right now. Shortly after GenCon, I received a shipment of games that I'd worked on from Asmodee. That shipment included Shakespeare and Barony, along with several others. I'd spent most of GenCon demoing Starfighter - and I still think that Starfighter was the best game in the booth - but Barony was another game that my team covered and that I needed to be familiar with. I only ran a few Barony demos, but I liked the game. It was simple to learn and very playable. So I looked forward to getting it to the table at home. And ... time passed. 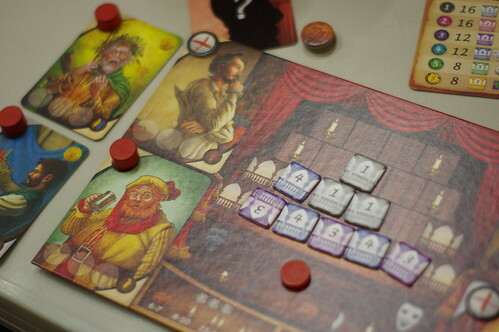 Several of the Wednesday game folks are theater geeks, so Shakespeare hit the table long before Barony did. And Shakespeare was a hit. And rightly so. But, because it hit the table first, I'm going to talk about it first. In Shakespeare, you are trying to produce the best play. You start with four characters available to you, but as the game goes on, you will draft more characters (one per turn, in fact), most of whom will give you additional actions. But it's all about the play. On your turn, you need to bid how many actions you're taking that turn. Fewest actions bid gets to go first. Each action will do one of a handful of things - you can assemble costumes for your actors, you can dress your set, you can improve your overall ambiance, you can raise money, or you can advance on one of the three "act" tracks. Most of these will help you advance your overall score. There are two basic character types: Actors and Craftspeople. Craftspeople can dress your set or make costumes for your characters (depending on types). Actors have spaces for costumes on the bottom of their cards (in the image above, the characters pictured are all actors and none of them have costumes underway). Set pieces have special effects that trigger once played. Especially good costumes can score points and other benefits, as well, and you want your characters in full costume, because only then can you use that actor during Rehearsal. Twice during the game (near the end), you will hold rehearsals in which actors who have their full costumes (three pieces) also have a special ability that they can trigger. The vast majority of these allow you to advance one of the three "act" tracks that's on the main board. And then you score the three Acts. If it sounds like there are a lot of moving pieces in this game, it's because there are. Each player has one board (pictured above), and five Action discs (in the corners of three of the characters pictured above), four or five marker tokens (on the Ambiance track in the pic above), and a recruitment marker that shows when they've done their recruiting for the turn. Then there is a main board which tracks the score, the turn order, and players' progress along the various Acts (which are worth money or victory points when scored). It also provides a pool for the set and costume pieces which are available each turn, and most players set the character cards for recruitment near it, too. But, despite all of the moving pieces, this game flows really well. New players will struggle for a turn or two (and are definitely at a disadvantage against experienced players), but the flow of the game is pretty logical. It's a tricky game. Like most games, you want to make sure that you're not wasting actions, but you also don't want to bid too few and be left short. And characters who work one turn need to take the next turn off - so it's possible that you'll have more actions than you can use if you aren't paying enough attention. I've seen players focus on one scoring area and do well, but I've found that trying to do well in two (or more) areas is more successful. It's a tight game, too. It only runs for six turns, with rehearsals in turns Four and Six. After turn Six, you need to pay most of your characters. If you can't, each unpaid character costs you victory points. The winning scores I've seen in this game have been under twenty, and the span from first to fourth has usually been less than five points. It's possible that the winning scores will increase as we get more familiar with the characters and what options exist. This game is at an intermediate difficulty. Play is a little bit dry, and there very little direct player interaction. This game is beautifully illustrated, and the component quality is very high. All in all, this game has earned a spot in the car. It sees regular play, and will likely continue to do so for some time.